I was super excited about colaborating with Danielle, better know as Dani Notes! Who doesn't love their name or initial on something? As a gift from Dani Notes, I ordered a platter and designed it with some fun colors. 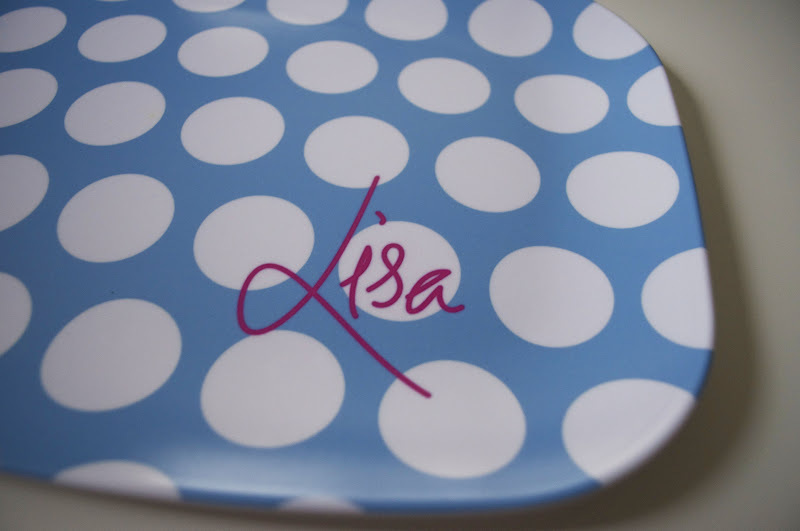 I wanted to have something a little more casual and colorful so I chose Cornflower blue with polka dots and my name in Magenta! If that doesn't scream fun, I don't know what does!! Super cute huh? Her shop is so cute and she has cases for the new iPhone 5 too! 2. I wanted you to see how cute the polka dots are! Danielle has the cutest Etsy shop, and is so sweet, and in case you didn't know her here is a little bit about her. Danielle Silver has always had a passion for paper, design and illustration. She received her Masters in graphic designs from the Savannah College of Art and Design, and pursued her career in Atlanta, Georgia. While she enjoyed her work as an Art Director in the advertising and publishing field, Dani found the most joy in designing unique invitations, birth announcements, and holiday cards for friends and family. This creative freedom, and the personal touch of each design, is why she began Daninotes. Dani Notes uses cool, stylish colors combined with sweet designs - from preppy stripes and whimsical flowers to classic, custom monograms with a modern twist. You know by now that I love to share a great designer, or product with you! 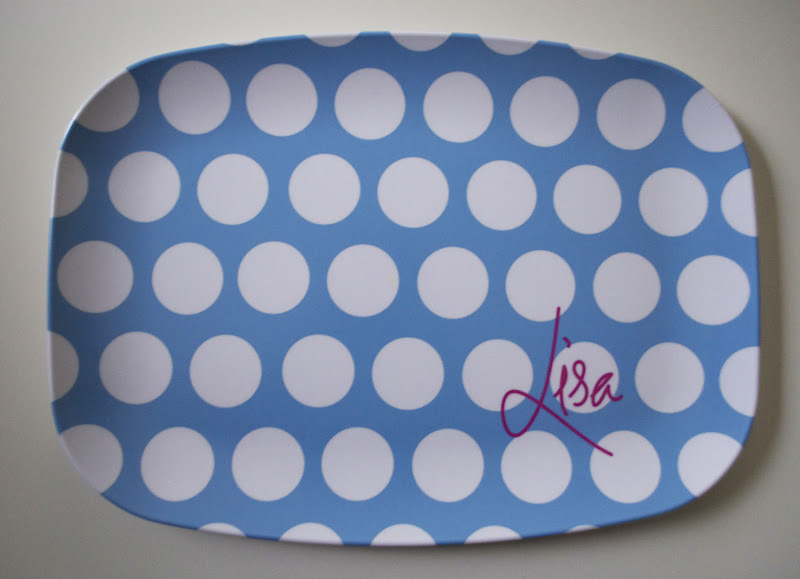 So enter to win a platter of your choice to use for all your parties, or even give it as a gift! It would be such a wonderful housewarming, new bride, or even christmas gift!! Follow the instructions below in the rafflecopter form and enter to win!! And as always, I will be verifying entries so please make sure you follow the rules! i'd personalize mine like the pink one you have in the post but with a fancier monogram. i love it! I would go with a navy greek key pattern and a fun kelly green round script monogram in the center :) Thanks for sharing this lovely lady! Happy Friday! There are too many to choose from! I love them all! For Christmas a bright green striped platter with my monogram in red in the center. For the rest of the year: navy chevron with my name in yellow or grey in the corner. I love all the combinations! I love the gray chevron with a pool colored monogram! Great giveaway!! 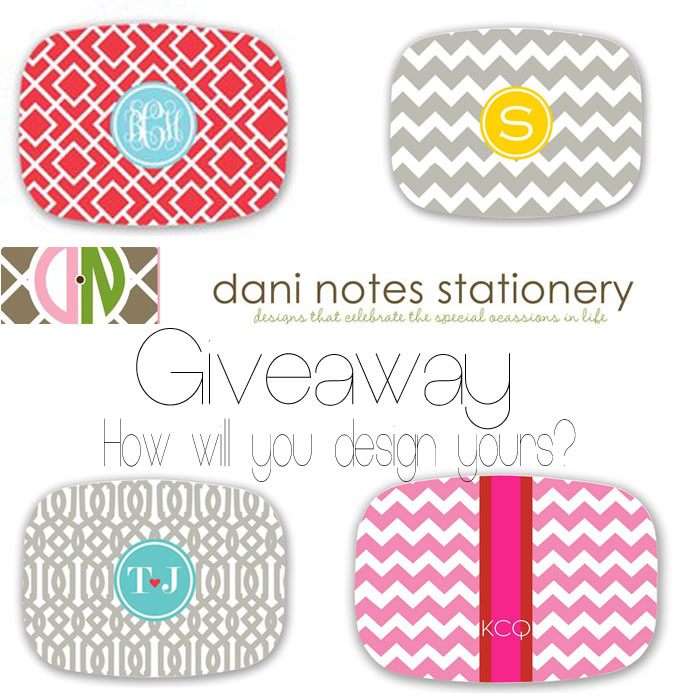 I'd probably personalize mine with navy blue chevron stripes and a hot pink monogram :) love everything in her shop! This is a wonderful giveaway. I would design it with black and white chevron and a pink monogram!! I would do something with red, since I have it so much in my house! Is it okay to copy yours?? I love the signature in the corner - you could line up yours cookies around it. Or you could just give me the macarons, lol! I love the strong geometric patterns! I like the pink chevron with my monogram on it! I love them all...I hope I win so I can design my own! Prob something pink!